This hike begins off Forest Road #2329. There is a large parking area and this hike is very popular for hikers and horseback riders.... and mosquitos. The name of this hike is a bit misleading. The trail follows a ridge line almost the entire distance. Having said that, the trail begins climbing right out of the parking area. The trail climbs so steeply in places that steps have been put in place to decrease the erosion. 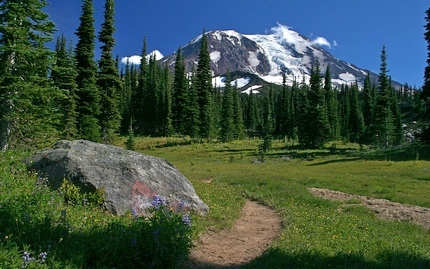 One of the main reasons that this hike is so popular are the tremendous wildflower displays. The trail climbs steeply for the first two miles, and is mostly in dense forest. Eventually, you break out into meadowed areas with vast wildflower displays. There are a number of small streams to cross as you continue toward Mt Adams. As soon as you enter these more open areas you are treated to fantastic views of Mt Adams right in front of you and Mt Rainier in the distance to the north which is directly behind you. 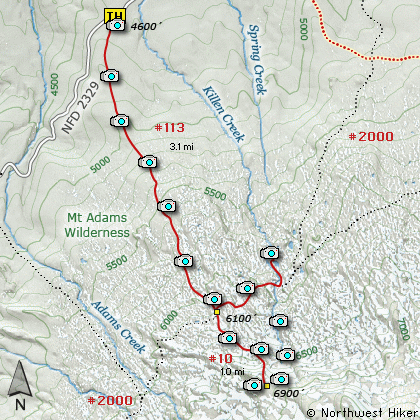 At about 3 miles you come to the junction of Pacific Crest Trail #2000. To continue on to the High Divide Camp, bear right for a hundred feet or so and you will see the less used trail heading directly toward Mt Adams. This part of the trail becomes much steeper and harder to follow, depending on the season you are there. It is about another mile of steep rocky climbing to the place called High Camp. This extra part of the hike is so worth the effort. You will find yourself on the very flank of Mt Adams, surrounded by more beauty than the eye can behold. From Portland, travel east on Interstate Hwy 84 to Exit 64 at Hood River. Turn left, and pass under the freeway and cross the toll bridge ($2.00) into Washington state. Turn left onto SR14 and drive approximately 1.5 miles to state road 141 Alt. Turn right onto SR141 Alt. and follow it another 2 miles and merge bearing left onto SR141. Then travel north on SR141 for another 19 miles to Trout Lake and the junction to Mt. Adams Road. Bear right and forward onto Mt. Adams Road for about 1.3 miles and you come to the junction with Forest Road 23. Bear left and ahead onto FR23 and continue north for about 19 miles and you will come to the junction with Forest Road 90. Take a sharp right uphill turn and continue on FR23. At this point the road becomes very rough surface and you will follow this road for just under 3 miles. You then come to the junction of Forest Road 2334. Bear right and continue on FR23 for another 1.4 miles. You will then come to the junction with Forest Road 2329. Bear right and straight ahead onto FR2329. FR2329 is paved for the next mile, but don't get used to it. It turns to gravel again for the remainder of the journey. After leaving FR23 you will travel about 5.8 miles and come to the trailhead for Killen Creek on your right.